Volunteer • Long Island Cares, Inc.
Long Island Cares supports nearly 600 food pantries, soup kitchens, and emergency shelters, some of which need the support of regular volunteers. If you wish to volunteer with one of our member agencies , please contact them directly to see if they are in need of volunteer support. 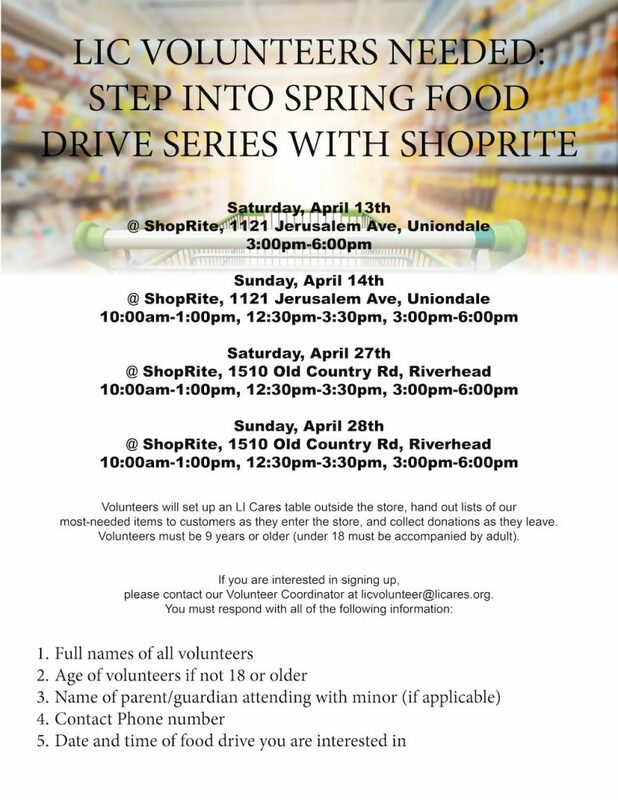 Volunteer just a few hours of your time with Long Island Cares and help make a difference in the lives of thousands of Long Islanders who are experiencing hunger, poverty or food insecurity. Volunteers are a very important part of our operation. If it were not for our community volunteers, we could not do what we do! Groups of more than 5 people MUST e-mail our Volunteer Coordinator directly at licvolunteer@licares.org. Long Island Cares is thrilled to once again partner with Metallica for the second annual All Within My Hands Foundation Day of Service. The nation-wide service day will be on Wednesday, May 22nd and once again invite you to join us! Last year hundreds of thousands of pounds of food was packed and distributed to those in need! Please consider giving back and email LICvolunteer@licares.org to find out more. Long Island Cares member agency food pantries and soup kitchens across Nassau and Suffolk Counties, New York. Please email volunteer@licares.org for more information! Join the Long Island Cares volunteer team now: Just complete the Volunteer Registration Form and the Volunteer Liability Release Form. The Volunteer Liability Release Form MUST be completed and emailed or faxed to our Volunteer Coordinator at (631) 273-2184; licvolunteer@licares.org; or mailed to us at 10 Davids Dr., Hauppauge, NY 11788 before you will be eligible to volunteer. Thank you so much for helping us make a difference in the lives of your Long Island neighbors. Already a volunteer? If you’re on the schedule and coming into the warehouse soon, please take a look at the Volunteer Food and Safety Video. It will take just 6 minutes of your time and covers very important info about the warehouse. Have a question about volunteering? Find the answer here or contact us.